Related Topics: Science projects, videos and experiments for various grades and topics. The following diagrams show the test for Carbon Dioxide. 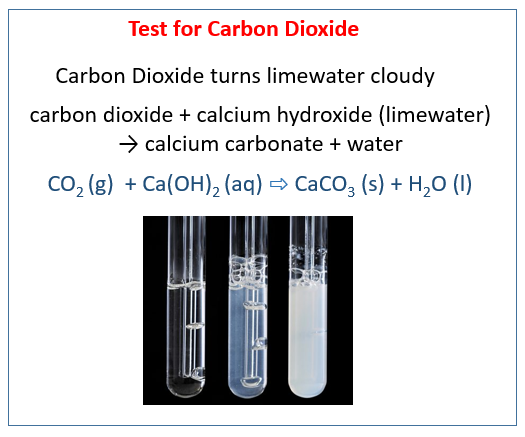 Carbon Dioxide will turn limewater (calcium hydroxide) cloudy. Scroll down the for examples and explanations. Using lime water is a fun and easy way to test for the presence of carbon dioxide. The exhaled carbon dioxide is used to produce a precipitate of calcium carbonate with the lime water. 1. Add 50 ml of lime water to two 100 ml beakers. 2. Bubble room air through one beaker for one minute using a pipette and pipette pump. Observe and record the results. 3. With the other beaker, bubble exhaled air through the solution for 1 minute. Try to bubble the air through the same rate that you did with the first beaker. After 1 minute record your results. Lime water is a solution of calcium hydroxide (Ca(OH)2). They react to form calcium carbonate (CaCO3) and water. Calcium carbonate is insoluble and forms a white precipitate. If CO2 continues to be passed, more carbonic acid forms, which then reacts with the calcium carbonate to form calcium hydrogencarbonate, which is soluble, so the precipitate is seen to dissolve. In this experiment we will investigate the carbon dioxide levels of inhaled and exhaled air. We use limewater to test for the presence of carbon dioxide. Here is some pure water, which has a pH of 7, shown by using this testing paper and matching the color to the chart on the side of the box. If I take a straw and blow into the water, what gases are going into the water? The one I am interested in is carbon dioxide, which can dissolve in water and react to form an acid. So after I blow into the water several times, I should have a solution which is more acid than it was before. Let's check by retesting the pH of the solution. It is now down to 5, rather than the 7 it was as pure water. pH 5 is an acid, so the carbon dioxide has dissolved in the water and reacted. Thus my chemical reaction really has made hydrogen ions in the water, meaning that the carbon dioxide gas dissolved and reacted. What does this mean about rain which passes through air with CO2 in it?